Francisco Paulino Hermenegildo Teódulo Franco y Bahamonde (December 4, 1892 – November 20, 1975), abbreviated Francisco Franco y Bahamonde and commonly known as Generalísimo Francisco Franco, was the Dictator of Spain in parts of the country from 1936, and in its entirety from 1939 until his death in 1975. He presided over the government of the Spanish State as the "the Leader of Spain" (Caudillo de España) and "the Supreme General" (el Generalísimo) following victory in the Spanish Civil War. From 1947, he was de facto regent of Spain, and after his death, the Spanish monarchy was restored according to Franco's own wishes. Franco did not have deep political convictions, but rose to power in order to preserve a traditional way of life that was threatened, in his view, by communism and its left-wing sympathizers. His main concern was to give the force of law to Catholic morality, and to crush what were allegedly communist-dominated trade unions. Although his Nationalist ideology was in some ways similar to those of Adolf Hitler's Nazi party and to Mussolini's Fascists, from whom he received help during the Civil War, Franco remained neutral during World War II, although he did provide minimal assistance to Germany. On the other hand, he allowed Jewish refugees to pass safely through Spain. Some may see Franco as a champion of traditional values, including the importance of the family, over and against the left-wing Socialists and Marxists whom he opposed in the Civil War. Nevertheless, his brutal treatment of anyone who did not conform to his values greatly diminishes his place in history. Franco's rule arguably retarded not only Spanish democracy but also the Spanish economy. Spain was isolated within Europe and unable to join the European Union (then the Common Market) because of the political unacceptability of its regime. However, Spain benefited from an agreement with the U.S. to station troops there, negotiated by Dwight D. Eisenhower. This did result in economic improvement, and contributed to international recognition of Franco's regime when Spain became a United Nations member in 1955. Franco was born in Ferrol, Galicia, Spain (between 1938 and 1982, his hometown would be known officially as El Ferrol del Caudillo). His father, Nicolás Franco Salgado-Araujo, was a Navy paymaster and a violent alcoholic who mistreated his family. His mother, Pilar Bahamonde Pardo de Andrade, also came from a family with naval tradition. His siblings included Nicolás, navy officer and diplomat, Pilar, a well-known socialite, and Ramón, a pioneering aviator who was hated by many of Francisco Franco's supporters. Francisco was to follow his father into the navy, but entry into the Naval Academy was closed from 1906 to 1913. To his father's chagrin, he decided to join the army. In 1907, he entered the Infantry Academy in Toledo, where he graduated in 1910. He was commissioned as a second lieutenant. Two years later, he obtained a commission to Morocco. Spanish efforts to physically occupy their new African protectorate provoked a long, protracted war (from 1909 to 1927) with native Moroccans. Tactics at the time resulted in heavy losses among Spanish military officers, but also provided the chance of earning promotion through merit. This explains the saying that officers would get either la caja o la faja (a coffin or a general's sash). Franco soon gained a reputation as a good officer. He joined the newly formed regulares colonial native troops with Spanish officers, who acted as shock troops. In 1916, at the age of 23 and already a captain, he was badly wounded in a skirmish at El Biutz. This action marked him permanently in the eyes of the native troops as a man of baraka (good luck, derived from the Arabic for "blessing"). He was also proposed unsuccessfully for Spain's highest honor for gallantry, the coveted Cruz Laureada de San Fernando. Instead, he was promoted to major (comandante), becoming the youngest staff officer in the Spanish Army. From 1917 to 1920, he was posted on the Spanish mainland. That last year, Lieutenant Colonel José Millán Astray, a histrionic but charismatic officer, founded the Spanish Foreign Legion, along similar lines to the French Foreign Legion. Franco became the Legión's second-in-command and returned to Africa. In summer 1921, the overextended Spanish army suffered (on July 24) a crushing defeat at Annual (Morocco) at the hands of the Rif tribes led by the Abd el-Krim brothers. The Legión symbolically, if not materially, saved the Spanish enclave of Melilla after a grueling three-day forced march led by Franco. In 1923, already a lieutenant colonel, he was made commander of the Legión. The same year, he married María del Carmen Polo y Martínez Valdés and they had one child, a daughter, María del Carmen, born in 1926. As a special mark of honor, he was best man (padrino) at the wedding was King Alfonso XIII of Spain, a fact which would mark him, during the Second Spanish Republic, as a monarchical officer. Promoted to colonel, Franco led the first wave of troops ashore at Alhucemas in 1925. This landing in the heartland of Abd el-Krim's tribe, combined with the French invasion from the south, spelled the beginning of the end for the shortlived Republic of the Rif. Becoming the youngest general in Spain in 1926, Franco was appointed, in 1928, director of the newly created Joint Military Academy in Zaragoza, a common college for all Army cadets. At the fall of the monarchy in 1931, in keeping with his prior apolitical record, he did not take any remarkable attitude. But the closing of the Academy, in June, by then War Minister Manuel Azaña, provoked the first clash with the Republic. 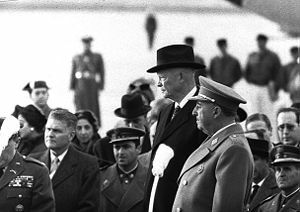 Azaña found Franco's farewell speech to the cadets insulting, resulting in Franco remaining without a post for six months and under constant surveillance. On February 5, 1932, he was given a command in La Coruña. Franco avoided being involved in Jose Sanjurjo's attempted coup that year. As a side result of Azaña's military reform, in January 1933, Franco was relegated from the first to the 24th in the list of Brigadiers; conversely, the same year (on February 17), he was given the military command of the Balearic Islands—a post above his rank. New elections were held in October 1933, which resulted in a center-right majority. In opposition to this government, a revolutionary movement broke out October 5, 1934. This attempt was rapidly quelled in most of the country, but gained a stronghold in Asturias, with the support of the miners' unions. Franco, already general of a Division and assessor to the war minister, was put in command of the operations directed to suppress the insurgency. The forces of the Army in Africa were to carry the brunt of the operations, with General Eduardo López Ochoa as commander in the field. After two weeks of heavy fighting (and a death toll estimated between 1,200 and 2,000), the rebellion was suppressed. The uprising and, in general, the events that led over the next two years to the civil war, are still under heavy debate (between, for example, Enrique Moradiellos and Pio Moa). Nonetheless, it is universally agreed that the insurgency in Asturias sharpened the antagonism between left and right. Franco and Lopez Ochoa—who up to that moment was seen as a left-leaning officer—were marked by the left as enemies. Lopez Ochoa was persecuted, jailed, and finally killed at the start of the war. Some time after these events, Franco was briefly commander-in-chief of the Army of Africa (from February 15, 1935, onwards), and from May 19, 1935, on, Chief of the General Staff, the top military post in Spain. After the ruling coalition collapsed amid the Straperlo corruption scandal, new elections were scheduled. Two wide coalitions formed: The Popular Front on the left, with Republicans to the Communists, and the Frente Nacional on the right, with the center radicals to the conservative Carlists. On February 16, 1936, the left won by a narrow margin. The days after were marked by near-chaotic circumstances. Franco lobbied unsuccessfully to have a state of emergency declared, with the stated purpose of quelling the disturbances and allowing an orderly vote recount. Instead, on February 23, Franco was sent away to be military commander of the Canary Islands, a distant place with few troops under his command. Meanwhile, a conspiracy led by Emilio Mola was taking shape. Franco was contacted, but maintained an ambiguous attitude almost up until July. On June 23, 1936, he even wrote to the head of the government, Casares Quiroga, offering to quell the discontent in the army, but was not answered. The other rebels were determined to go ahead, whether con Paquito o sin Paquito (with Franco or without him), as said by José Sanjurjo the honorary leader of the military uprising. After various postponements, July 18 was fixed as the date of the uprising. The situation reached a point of no return and, as presented to Franco by Mola, the coup was unavoidable and he had to choose a side. He decided to join the rebels and was given the task of commanding the African Army. A privately owned DH 89 De Havilland Dragon Rapide, (still referred to in Spain as the Dragon Rapide), was chartered in England on July 11, to take him to Africa. The assassination of the right-wing opposition leader José Calvo Sotelo by government police troops (quite possibly acting on their own, as in the case of José Castillo precipitated the uprising. On July 17, one day earlier than planned, the African Army rebelled, detaining their commanders. On July 18, Franco published a manifesto and left for Africa, where he arrived the next day to take command. A week later, the rebels, who soon called themselves the Nacionales (literally Nationals, but almost always referred to in English as Nationalists) controlled only a third of Spain, and most navy units remained under control of the opposition Republican forces, which left Franco isolated. The coup had failed, but the Spanish Civil War had begun. Despite Franco having no money while the state treasure was in Madrid with the government, there was an organized economic lobby in London looking after his financial needs, with Lisbon as their operational base. At the end he was to receive an enormous help from very important economic persons who acted as well as his diplomatic boosters. The first days of the rebellion were marked with a serious need to secure control over the Protectorate. On one side, Franco managed to win the support of the natives and their (nominal) authorities, and, on the other, to ensure his control over the army. This led to the execution of some senior officers loyal to the republic (one of them his own first cousin). Franco had to face the problem of how to move his troops to the Iberian Peninsula, because most units of the Navy had remained in control of the republic and were blocking the Strait of Gibraltar. His request to Mussolini for help was granted with an unconditional offer of arms and planes; Wilhelm Canaris in Germany persuaded Hitler to follow as well. From the July 20 onward, he was able, with a small group of 22 mainly German Junkers Ju-52 airplanes, to initiate an air bridge to Seville, where his troops helped to ensure the rebel control of the city. Through representatives, he started to negotiate with the United Kingdom, Germany, and Italy for more military support, and above all for more airplanes. Negotiations were successful with the last two on July 25, and planes began to arrive in Tetouan on August 2. On August 5, Franco was able to break the blockade with the newly arrived air support, successfully deploying a ship convoy with some 2,000 soldiers. On September 21, with the head of the column at the town of Maqueda (some 80 km away from Madrid), Franco ordered a detour to free the besieged garrison at the Alcázar of Toledo, which was achieved September 27. This decision was controversial even then, but resulted in an important propaganda success, both for the fascist party and for Franco himself. The designated leader of the uprising, Gen. José Sanjurjo had died on July 20, in an air crash. The nationalist leaders managed to overcome this through regional commands: (Emilio Mola in the North, Gonzalo Queipo de Llano in Andalusia, Franco with an independent command and Miguel Cabanellas in Aragon), and a coordinating junta nominally led by the last, as the most senior general. On September 21, it was decided that Franco was to be commander-in-chief, and September 28, after some discussion, also head of government. It is speculated that the decision belonged to Hitler. Mola considered Franco as unfit and not part of the initial revolutionary group. Hitler, however, had delivered until then his own help only to Franco who has signed for it and wanted as leader the one who had the written obligation to recognize it, as Hitler expected recompensation mainly from the steel producing Basque areas. Mola had to give in because he was very aware that without the support of the two dictators, the uprising was doomed to fail. On October 1, 1936, Franco was publicly proclaimed as Generalísimo of the Fascist army and Jefe del Estado (Head of State). When Mola was killed in another air accident a year later, none of the military leaders that organized the conspiracy against the Republic, between 1933-35, were still alive. It is still disputed whether Mola's death was a deliberate assassination by the Germans. Mola was rather inclined to the Italians and feared the German intervention in Spain. It was later said that Franco was feeling more at ease at his post without any leading military leader of the initial uprising above him. Mola's death later allowed Franco to pose as a political figure, despite having no connection with any political movement. From that time until the end of the war, Franco personally guided military operations. After the failed assault on Madrid in November 1936, Franco settled to a piecemeal approach to winning the war, rather than bold on maneuvering. As with his decision to relieve the garrison at Toledo, this approach has been subject of some debate; some of his decisions, such as, in June 1938, when he preferred to head for Valencia instead of Catalonia, remain particularly controversial. Unable to receive support from any other nation, his army was supported by Nazi Germany in the form of the Condor Legion, ironically Franco only asked for weapons and tanks and never for the air services of the Condor Legion. Yet, these German forces provided maintenance personnel and trainers, and some 22,000 Germans and 91,000 Italians served over the entire war period in Spain. Principle assistance was received from Fascist Italy (Corpo Truppe Volontarie), but the degree of influence of both powers on Franco's direction of war seems to have been very limited. Nevertheless, the Italian troops, despite not always being effective, were very present in most of the large operations in big numbers while the CTV aviation dominated the skies for most of the war period. Franco was receiving many and frequent supplies from both dictators while the Republicans had tremendous difficulties to buy anything modern and even Russia stopped their supplies after a certain period. It is said that Franco's direction of the Nazi and Fascist forces was limited, particularly in the direction of the Condor Legion, however, he was officially, by default, their superior commander and rarely could they act on their own. António de Oliveira Salazar's Portugal also openly assisted the Nationalists from the start. The support of Mussolini and Hitler continued until the very end of the Civil War and Italian and German troops paraded on the day of the final victory in Madrid. It is known, however, that at the backstage of things, both Mussolini and Hitler considered him as a poor military figure, as he had promised to take the capital in only three months (it took him three years). There even came a moment where they wanted to rescind their support of him, but due to prestige reasons that would have negative consequences in the diplomatic arena against the two dictators, it was decided to continue assisting him until the end. He managed to fuse the ideologically incompatible national-syndicalist Falange ("phalanx," a far-right Spanish political party) and the Carlist monarchist parties under his rule. This new political formation appeased the more extreme and germanophile Falangists while tempering them with the anti-German, pro-Spain Carlists. The Falangists movement slowly moved away from its Fascist ideology after negotiations with Hitler revealed that Germany wanted Spain as a pawn and did not care about Spain or the Falange. From early 1937, every death sentence had to be signed (or acknowledged) by Franco. However, this does not mean that he had intimate or complete knowledge of every official execution. It is interesting to note, while it seems that Franco was allowing Germany free reign in Spain, Franco was continually working to prevent the advance of German forces into Spain. During World War II, Admiral Wilhelm Canaris had regular meetings with France and informed Franco of Germany's attitude and plans for Spain. This information prompted Franco to surreptitiously reposition his best and most experienced troops to camps near the Pyrenees and to reshape the terrain to be unfriendly to tanks and other military vehicles. In the face of German pressure, Spain was also responsible for the safe passage of 45,000-60,000+ Jews. This was accomplished by allowing any Jews who made it to the Spanish border entrance into Spain. Furthermore, any Jew who made it to a Spanish Embassy was granted Spanish citizenship on the basis of being a Sephardic Jew, even if there was no evidences of Sephardism. When Franco was warned that Hitler would not be pleased with this policy and that he would have to face Hitler about this, Franco responded that he would rather face Hitler for aiding the Jews than to face God for not aiding them. On March 4, 1939, an uprising broke out within the Republican camp, claiming to forestall an intended Communist coup by prime minister Juan Negrín. Led by Colonel Segismundo Casado and Julián Besteiro, the rebels gained control over Madrid. They tried to negotiate a settlement with Franco, who refused anything but unconditional surrender. They gave way; Madrid was occupied on March 27, and the Republic fell. The war officially ended on April 1, 1939. However, during the 1940s and 1950s, guerrilla resistance to Franco (known as "the maquis") was widespread in many mountainous regions. In 1944, a group of republican veterans, which also fought in the French resistance against the Nazis, invaded the Val d'Aran in northwest Catalonia, but they were easily defeated. Spain was bitterly divided and economically ruined as a result of the civil war. After the war, a very harsh repression began, with thousands of summary executions, an unknown number of political prisoners and tens of thousands of people in exile, largely in France and Latin America. The 1940 shooting of the president of the Catalan government, Lluís Companys, was one of the most notable cases of this early repression, while the major groups targeted were real and suspected leftists, ranging from the moderate, democratic left to Communists and Anarchists, the Spanish intelligentsia, atheists, and military and government figures who had remained loyal to the Madrid government during the war. The bloodshed in Spain did not end with the cessation of hostilities; many political prisoners suffered execution by the firing squad, under the accusation of treason by martial courts. During the war, Franco's Spain also proved to be an escape route for several thousands of, mainly Western European Jews fleeing deportation to concentration camps from occupied France. Spanish diplomats extended their protection to Sephardi Jews from Eastern Europe too, especially in Hungary. As such, Franco's Spain proved to be a safe haven for Jews and a country effectively undertaking more to help Jews escape deportation to the concentration camps than many neutral (Switzerland, Turkey) and Allied countries did. With the end of World War II, Franco and Spain were forced to suffer the economic consequences of the isolation imposed on it by nations such as the United Kingdom and the United States. This situation ended in part when, due to Spain's strategic location in light of Cold War tensions, the United States entered into a trade and military alliance with Spain. This historic alliance commenced with United States President Eisenhower's visit in 1953, which resulted in the Pact of Madrid. This launched the so-called "Spanish Miracle," which developed Spain into a semi-capitalist nation. During the 1960s, Francist Spain's population would experience an enormous increase in personal wealth. Spain was admitted to the United Nations in 1955. In spite of this, once in power, Franco almost never left Spain. Lacking any strong ideology, Franco initially sought support from National syndicalism (nacionalsindicalismo) and the Roman Catholic Church (nacionalcatolicismo). He was openly supported by the Church, who knew, for example, that he would reverse the Second Republic's legalization of divorce. Franco placed great stress on family values, on their right to own property, and on the dignity of labor. His coalition-ruling single party, the Movimiento Nacional, was so heterogeneous as to barely qualify as a party at all, and was certainly not an ideological monolith like the Fascio di Combattimento (Fascist Party of Italy) or the ruling block of Antonio Salazar in Portugal. His Spanish State was chiefly a conservative—even traditionalist—rightist regime, with emphasis on order and stability, rather than a definite political vision. In 1947, Franco proclaimed Spain a monarchy, but did not designate a monarch. This gesture was largely done to appease monarchist factions within the Movimiento. Although a self-proclaimed monarchist himself, Franco had no particular desire for a king, and as such, he left the throne vacant, with himself as de facto regent. He wore the uniform of a Captain General (a rank traditionally reserved for the King) and resided in the El Pardo Palace (not to be confused with the El Prado museum). In addition, he appropriated the kingly privilege of walking beneath a baldachin (canopy), and his portrait appeared on most Spanish coins. Indeed, although his formal titles were Jefe del Estado (Chief of State), and Generalísimo de los Ejércitos Españoles (Generalísimo of the Spanish Armed Forces), he had originally intended any government that succeeded him to be much more authoritarian than the previous monarchy. This is indicated in his use of "by the grace of God" in his official title. It is a technical, legal phrase which indicates sovereign dignity in absolute monarchies, and is only used by monarchs. During his rule, non-government trade union]]s and all political opponents across the political spectrum, from communist and anarchist organizations to liberal democrats and Catalan or Basque nationalists, were suppressed. The only legal "trade union" was the government-run Sindicato Vertical. In order to build a uniform Spanish nation, the public usage of languages other than Spanish (especially Catalan, Galician, and Basque languages) was strongly repressed. Language politics in Francoist Spain stated that all government, notarial, legal, and commercial documents were drawn up exclusively in Spanish and any written in other languages were deemed null and void. The usage of other than Spanish languages was banned on road and shop signs, advertising, and, in general, all exterior images of the country. All cultural activities were subject to censorship, and many were plainly forbidden on various, many times spurious, grounds (political or moral). This cultural policy relaxed with time, most notably after 1960. The enforcement by public authorities of strict Catholic social mores was a stated intent of the regime, mainly by using a law (the Ley de Vagos y Maleantes, Vagrancy Act) enacted by Manuel Azaña. In 1953, Catholicism was officially recognized as integral to the culture of Spain and the Vatican recognized Franco's regime. The remaining nomads of Spain (Gitanos and Mercheros like El Lute) were especially affected. In 1954, homosexuality, pedophilia, and prostitution were, through this law, made criminal offenses. Its application was inconsistent. In every town, there was a constant presence of Guardia Civil, a military police force, who patrolled in pairs with submachine guns, and functioned as his chief means of control. He was constantly worried about a possible Masonic conspiracy against his regime. This has even been described by some non-Spanish authors to have gradually turned into an "obsession." In popular imagination, he is often remembered as in the black and white images of No-Do newsreels, inaugurating a reservoir, hence his nickname Paco Ranas (Paco—a familiar form of Francisco—"Frogs"), or catching huge fish from the Azor yacht during his holidays. 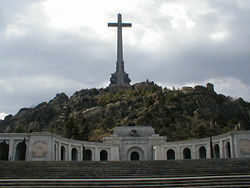 Santa Cruz del Valle de los Caídos, which has since been turned into a memorial to all casualties of the Spanish Civil War. Famous quote: "Our regime is based on bayonets and blood, not on hypocritical elections." In 1968, due to the United Nations' pressure on Spain, Franco granted Equatorial Guinea, a Spanish colony, its independence. In 1969, he designated Prince Juan Carlos de Borbón, with the new title of Prince of Spain, as his successor. This came as a surprise for the Carlist pretender to the throne, as well as for Juan Carlos's father, Juan de Borbón, the Count of Barcelona, who technically had a superior right to the throne. By 1973, Franco had given up the function of prime minister (Presidente del Gobierno), remaining only as head of the country and as commander in chief of the military forces. As his final years progressed, tension within the various factions of the Movimiento would consume Spanish political life, as varying groups jockeyed for position to control the country's future. Franco died on November 20 (or possibly November 19), 1975, at the age of 82. Since November 20 was the same date as the founder of the Falange, José Antonio Primo de Rivera, who died in 1936, some suspected that Franco's doctors were ordered to keep him alive by artificial means until that symbolic date. The historian, Ricardo de la Cierva, says that on the 19th, around 6 p.m., he was told that Franco had already died. Franco is buried at Santa Cruz del Valle de los Caídos, which has become a tomb for all the soldiers killed during the Spanish Civil War. Franco's successor as head of state was the current Spanish monarch, Juan Carlos. Though much beloved by Franco, the King held liberal political views which earned him suspicion among conservatives who hoped he would continue Franco's policies. Instead, Juan Carlos would proceed to restore democracy in the nation, and help crush an attempted military coup in 1981. Since Franco's death, almost all the place names named after him (most Spanish towns had a calle del Generalísimo) have been changed. This holds particularly true in the regions ruled by parties heir to the Republican side, while in other regions of central Spain rulers have preferred not to change such placenames, arguing they would rather not stir the past. Most statues or monuments of him have also been removed, and, in the capital, Madrid, the last one standing was removed in March 2005. Francisco Franco was declared a saint by Clemente Domínguez y Gómez (self-declared "Pope Gregory XVII") of the Palmarian Catholic Church, a right-wing Catholic mysticalist sect and apparition site largely based in Spain. Franco's canonization is not recognized by the Roman Catholic Church and the Vatican. At the time of Franco's death, on the then-new American television show, Saturday Night Live, as part of its satiric newscast Weekend Update, Chevy Chase announced, "Despite Franco's death and an expected burial tomorrow, doctors say the dictator's health has taken a turn for the worse." The segment also included a statement by Richard Nixon that "General Franco was a loyal friend and ally of the United States," accompanied by a photo of Franco and Adolf Hitler standing together and giving the Fascist/Nazi salute. Over the next several weeks it became a running joke for Chase to announce as part of the newscast, "This just in: Generalissimo Francisco Franco is still dead"! In 2005, an almost systematic search started on mass graves of people executed during his regime by the present socialist government in Spain, with an identical name with the main party in the government that lead the fight against him during the war (PSOE). There is talk of officially recognizing the crimes on civilians during the Francist rule after the Civil War. Some statutes of Franco and other public Francist signs have been removed. Additionally, the EU has taken steps on a European resolution on this topic which will rewrite some historic views on Franco. In Germany, a squadron named for Werner Mölders has been removed, as this pilot took part (leader of the escorting units) in the bombing of Guernica, which is speculated as been a target choice made by Franco and Mola and not by the German command of the Legion Condor, against such an historic and symbolic place for the Basques, to terrorize them for their secessionist movement. Raza (1941): Based on a script by "Jaime de Andrade" (Franco himself), it's the semi-autobiographical story of a military officer, played by Alfredo Mayo. Caudillo (1973): Documentary film about Francisco Franco before and during the Spanish Civil War. Franco, ese hombre (1964): Documentary film about Francisco Franco, directed by José Luis Sáenz de Heredia. About the romantic comedy You've Got Mail (1998) it is said that the character Birdie Conrad (Jean Stapleton) was a former lover of Franco in the 1940s. Calimero el Tirano, the dictator seen in the comedy Mortadelo & Filemon: The Big Adventure (2003), is a parody of Francisco Franco, played by Paco Sagárzazu. ↑ The Peerage, Carmen Franco y Polo, 1st Duquesa de Franco. Retrieved August 8, 2006. ↑ www.generalisimofranco.com, Discurso de Franco a los cadetes de la academia militar de Zaragoza. Retrieved July 21, 2006. ↑ www.nodulo.org, Sobre la imparcialidad del historiador y otras cuestiones de teoría de la Historia. Retrieved July 21, 2006. ↑ www.guerracivil1936.galeon.com, El triunfo del frente popular. Retrieved June 16, 2008. ↑ www.generalisimofranco.com, Manifesto de las palmas. Retrieved July 21, 2006. ↑ www.memoriahistorica.org, La Memoria de los Nuestros. Retrieved July 21, 2006. ↑ Giorgio Perlasca, The International Raoul Wallenberg foundation. Retrieved July 21, 2006. ↑ SNL Transcripts, Season 1: Episode 6—Weekend Update with Chevy Chase. Retrieved July 21, 2006. ↑ SNL Transcripts, Season 1: Episode 7—Weekend Update with Chevy Chase. Retrieved July 21, 2006. Bennassar, Bartolomé. Franco. Paris: Perrin, 1995. ISBN 978-2262010256. Ellwoood, Sheelagh M. Franco. New York: Longman, 1993. Yglesias, Jose. The Franco Years. New York: MacMillan, 1977. ISBN 978-0672523526. Biographical page in Spanish about "Francisco Franco"
Fundación Nacional Francisco Franco (in Spanish). A memorial foundation led by Franco's family, holding lots of documentation. Hitler Stopped by Franco—Franco's indirect help to the Allies and Jews. This page was last modified on 25 April 2017, at 14:42.